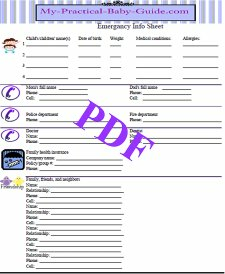 This Emergency Info Sheet is very important and can be lifesaving. Keep one in your diaper bag. Post on the refrigerator or near the phone. keep extras for friends, family, nanny, and other babysitters to take along on outings with your child.